The game of weiqi (also known as “Go” or “the game of encirclement”) has a history of over 4000 years. It is said that the legendary Emperor Yao has invented it before Xia dynasty in order to instruct his restless son Danzhu. This game is pure expression of Chinese pragmatism. One can develop a better understanding of Chinese methods in politics, in their businesses, and even in their social interactions. Politician Henry Kissinger defines it this way: Where the Western tradition prized the decisive clash of forces emphasizing feats of heroism, the Chinese ideal stressed subtlety, indirection, and the patient accumulation of relative advantage. If chess is about the decisive battle, then Weiqi is about the protracted campaign. The Chinese board game WEIQI (known as BADUK in Korean, GO in Japanese and familiar in the West under the Japanese term), one of the most significant symbols in the Chinese mental geography. 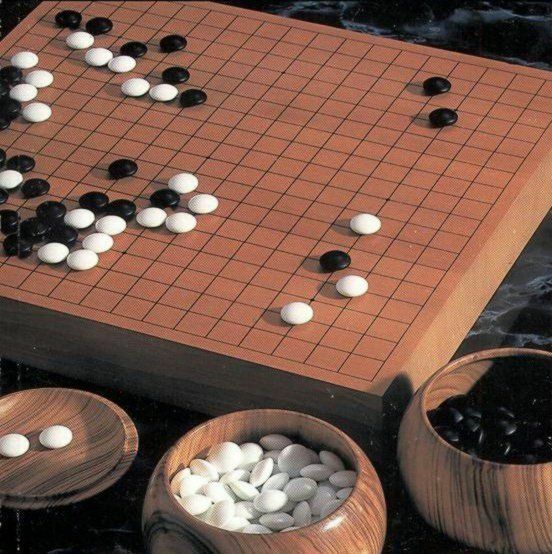 Weiqi or Go has only a few rules, and they can be learned in minutes. But even for this simplicity, the best players of today feel that they have not mastered the game. In Weiqi, two players take turns placing their stones (the black ones traditionally are made of Slate, and the white ones traditionally are made of Clamshells) on the intersections of lines on the board. There are 19 lines from one side of the board to the other, and 19 lines from the top to the bottom. The idea is to fence off more space than your opponent, outlining your “territory” with your stones. When stones are surrounded by stones of the opposite color, they are “dead” and can be “captured.” At the end of the game, the players figure out the amount of space they have claimed, and the one who has the most spaces wins. While Westerners might navigate a world mapped as an international or English chess board, the Chinese mind circulates on a Weiqi Board. The chronicle by Japanese writer Kawabata Yasunari (1899-1972) of an intense intellectual duel, translated in English as The Master of Go, certainly contributed to the popularity of the game in the West, but Weiqi is a product of Chinese civilization and spread over time in the educated circles of Northeast Asia. Kawabata, who viewed Master as one of his favorite creations, knew that for China the game of “abundant spiritual powers encompassed the principles of nature and the universe of Human Life“, and that the Chinese had named it “the diversion of the immortals”. In the Chinese imperial times, Weiqi had the status of an art whose its practice had educational, moral and intellectual purposes. In a Chinese version of the scholastic quadrivium, the mandarin scholars had to master the Four Arts, known as Qin, Qi, Shu and Hua. It was expected of the gentlemen to be able to play the Guqin (Qin), a seven-stringed zither, but also to write calligraphy (Shu) and demonstrate talent at brush-painting (Hua). The second artistic skill, Qi, is Weiqi, a strategy game played by two people who alternately place black and white stones on the vacant intersections of a grid. The winner of the game is the one who can control, after a series of encirclements, with more territory than his opponent. One can translate Weiqi as “the board game of encirclement” or “the surrounding game”. For centuries, literati have been fascinated by the contrast between the extreme simplicity of the rules and the almost infinite combinations allowed by their execution. Traditionally, the game was conceptualized in relation to a vision of the world. In the early 11th-century, “The Classic of Weiqi in Thirteen Sections”, inarguably the most remarkable essay on the topic, the author uses notions of Chinese philosophy to introduce the game’s material objects: the stones “are divided between black and white, on the Yin / Yang or the Day / Night model, the board is a square and tranquil, the pieces are round and active”. In the Classic of Weiqi, “The famous Book of Changes (Yi Jing)”, which presents the cosmology of Chinese antiquity, is quoted several times. During a Chinese chess game, one subtracts pieces; but in Weiqi, one adds stones to the surface of the board. “The best victory is gained without a fight, so the excellent position is one which does not cause conflict,” says the author of the “Classic of Weiqi”. It introduces what can be called the axiom of non-confrontation. Although many may come across this game, but not everyone understand the rich nature of this wonderful game. If you are looking for Weiqi trainings or private lessons in Singapore, either in group or individual, you may contact me using the below form.